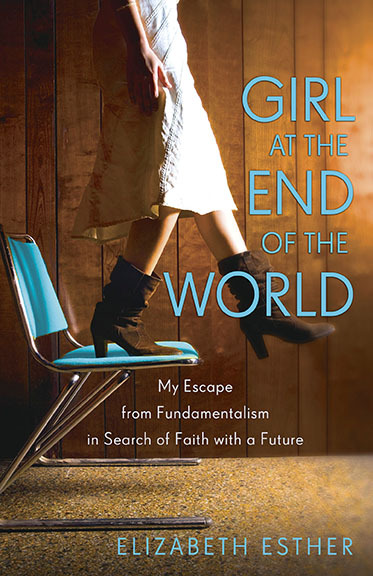 I downloaded my copy of blogger Elizabeth Esther’s memoir Girl at the End of the World: My Escape from Fundamentalism in Search of Faith with a Future on Tuesday morning. By Wednesday morning, I had finished the whole thing. This is not common (or even possible, usually) but her words were so riveting that I snuck moments in whenever I could. Throw in a load of laundry, read some, put the baby down for her nap, read some more, build train tracks with my toddler, read again. 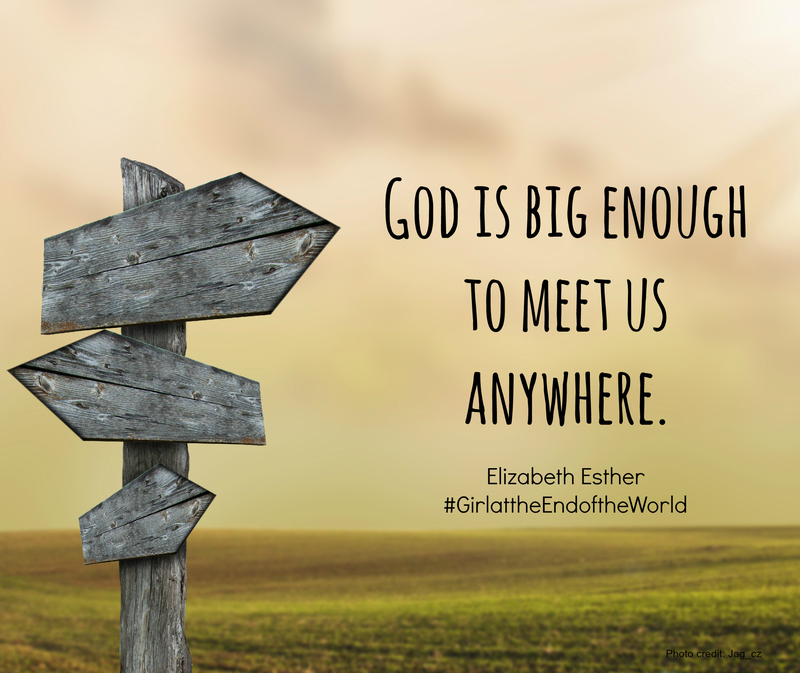 In her first book (and I hope there will be more) Elizabeth Esther tells the story of her childhood in a spiritually abusive fundamentalist cult called The Assembly, founded by her grandfather, and her slow escape from the cult as a young mother and wife. It’s not easy material to take in–I cried more than once and even stopped to beg-pray at one point. God, help me not to take advantage of the power I have over my children’s view of You. Please. Power and fear are major themes in the book. At a young age, we see Elizabeth enduring “discipline” from her elders, and nothing but contrite submission and total surrender is accepted in return. She suffers from severe anxiety and panic attacks related to her fear of being left behind if the rapture should happen and she hasn’t properly confessed all sin. Her family doesn’t accept mental illness as a reality though, so she never receives treatment. She believes, because she has been taught, that The Assembly is the way to God–and essentially this means that her grandfather and his followers are the way to God. The only empowerment is unquestioning obedience, because it will get her to heaven–even if it means her earthly life is miserable. The motif of mothers and daughters is woven skillfully throughout the book. Tender and impulsive, Elizabeth learns to keep a safe emotional distance from her grandmother and her mother, as they are responsible for what seems like the majority of correcting her “character flaws”. She endures daily spankings–reminders that she’ll never be good enough. Adulthood offers no freedom. Elizabeth marries a kind young man named Matt. The relationship offers some solace because the two are friends, and because Matt isn’t domineering, but Elizabeth soon realizes even their relationship isn’t safe from the scrutiny of The Assembly. Ultimately, they don’t have the power to make decisions about what their life together will look like. It takes motherhood to give Elizabeth the courage to leave, even though it doesn’t happen right away. In a pivotal scene, she’s expected to spank her daughter on her first birthday, a punishment for reaching for a bowl of chocolate. Children are trained to obey to the point that they won’t reach for sweets or toys without their parents’ pre-approval. Her mother dutifully fetches a wooden spoon, her grandmother looks on approvingly. Elizabeth shuts herself and her baby girl in the bathroom, torn between her own maternal intuition and the powerful pull of the cult’s teachings on child discipline–a misnomer because the purpose is to coldly break a child of any notion of preference or individuality. She stares up at me, smiling and innocently unaware of what is happening. It is her first birthday. She is my baby, and I am doing this to her. I am training her the way I have been trained. Indeed, to break her will, I’d begun spanking Jewel at six months old. Oh God. Help me. Help me now. I wait, the tears still coursing down my cheeks. In this moment, the trajectory begins to shift. It’s the slow gathering of courage through Elizabeth’s relationship with her oldest daughter that builds into a new kind of strength over the years. She and her husband confront her grandparents for multiple abuses of power and finally leave the cult. They spend years acclimating to the outside American culture and trying to find a new way to worship and connect with God. She’s drawn to the safety and beauty of Catholicism, even though she strongly disapproves of it at first. She finds strength through Mama Mary, explaining that when she couldn’t find Jesus, she went looking for his mother. She gains the strength to parent according to her own conscience, to be gentle with herself and seek the treatment she needs, and eventually even the strength for reconciliation with her parents. This book shook me up, I’ll be honest. I’ve felt emotionally raw ever since I finished it. I think this is a testament to Elizabeth Esther’s ability as a writer to transfer her real life experiences to the page. Her voice is warm, candid, devastating, and at times hilarious (love me some King James-flavored humor) and left me feeling grateful and hopeful for the power of love. It’s stronger than fear. Praise be to God. You can pick up a copy of this book here, here, OR leave a comment for a chance to win a free copy, on me! You can just say hello, or share a thought on this post, or maybe tell me about a time you were brave in your spiritual journey. I’ll pick a winner on Monday.